The AEP firmware version 1.3 or later supports installing and running user-created custom applications as well as managing them from DeviceHQTM. You can disable Node-RED to save system resources. The app can be installed either on an SD card or in flash. You can use an optional boolean variable to manage this or otherwise the app-manager takes care of it automatically based on the presence of an SD card. See manifest.json Details for more information. Application is packaged as a gzipped tar file containing all required files. This is exclusively used to install, uninstall, start, and stop custom apps. All required files must be present for successful installation. Download the custom app SDK template and extract the enclosed template tarball into your application directory. Modify manifest.json to contain the information about your app. See manifest.json Details for more information. 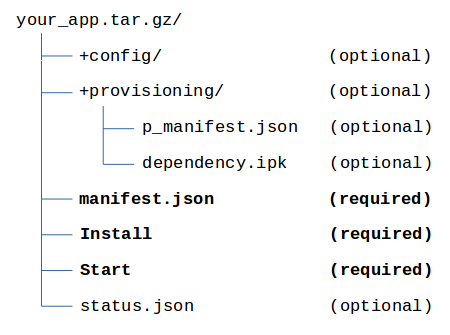 Update provisioning/p_manifest.json with all your IPK dependency files. Modify the Install script if you need extra dependency installation or other install setup beyond installing IPK files. This script is used to install and uninstall your app. See Install Script for more details. Modify the Start script to start and stop your application process(es) as needed. See Start Script for more details. If you have config files you want to update through DeviceHQ, place them in the config directory. Modify status.json with the default AppInfo string of your choosing. See status.json Details for more details. Organize the rest of your application content within this directory any way you like. The Conduit only cares about the location of the required and optional files noted above. You can also use monit to monitor your custom applications. Refer to the monit page for information on installation of the monit package and its use. You can backup/save Custom Apps when you save them in User Defined Defaults of the device. You must install them in the /var/config directory using the User Defined Defaults feature. Based on theme by NeoEase. Valid XHTML 1.1 and CSS 3.